Corey Kluber put on a record-breaking performance Tuesday night and still lost 1-0 to the San Diego Padres. 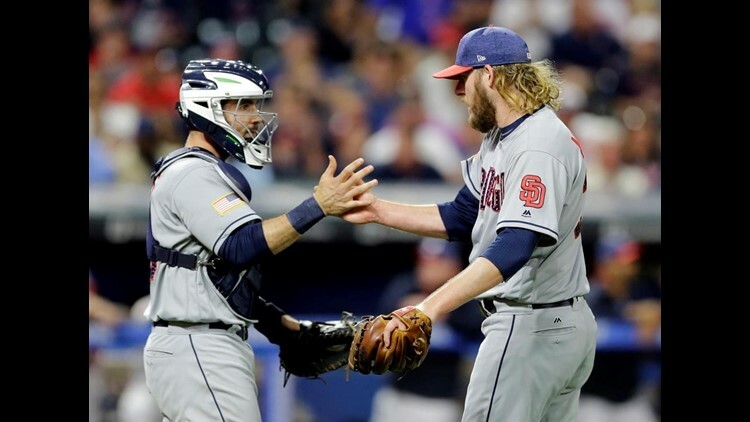 CLEVELAND (AP) — Corey Kluber put on a record-breaking performance Tuesday night and still lost 1-0 to the San Diego Padres. The ace right-hander struck out 10 in eight innings — setting a Cleveland Indians mark with five consecutive double-digit strikeout games. But the 2014 AL Cy Young Award winner received little help from his offense or defense. Cory Spangenberg drove in the only run with a groundout, and six San Diego pitchers combined on a five-hitter. Padres manager Andy Green knew his team was fortunate to come out on top against Kluber, who is headed to the All-Star Game next week. "You're facing a guy who is in a stretch of the best baseball of his career," Green said. "I don't think we took him down, but we got one across the board against him." Cleveland manager Terry Francona missed the game after he was admitted to the Cleveland Clinic for tests. Francona was hospitalized twice last month after feeling lightheaded and having a rapid heart rate. He was fitted with a heart monitor last week and said at the time doctors had ruled out any serious health issues. Team president Chris Antonetti said Francona did not experience the previous symptoms again, and the tests were being done to help determine what's causing the issue. Bench coach Brad Mills ran the team in Francona's absence. Kluber (7-3) yielded five hits and walked one, but Cleveland's defense let him down in the fifth when All-Star shortstop Francisco Lindor and second baseman Jason Kipnis failed to turn double plays on consecutive grounders. "It's frustrating, especially to be the one that more or less messed it up and have it be a one-run game," Kipnis said. Padres starter Trevor Cahill pitched 4 1/3 innings, and Jose Torres (5-2) retired All-Star Michael Brantley on a groundout with the bases loaded to end the fifth. Kirby Yates, Ryan Buchter, All-Star Brad Hand and Brandon Maurer, who worked the ninth for his 17th save, completed the shutout. Jose Ramirez was thrown out at home trying to score from third on a grounder in the second. Cleveland went 0 for 10 with runners in scoring position and stranded seven overall. "With the way it was going, you kind of thought one run might win it," Spangenberg said. "It was a great team win." Spangenberg's fielder's choice scored the lone run. The inning started when Hector Sanchez singled and Carlos Asuaje walked. Lindor fielded Erick Aybar's grounder but chose to go to second base himself instead of throwing to Kipnis, who was waiting at the bag. Lindor got the out at second but had no play at first. Kipnis fielded Spangenberg's grounder, but bobbled the ball taking it out of his glove. Aybar was forced at second, but Spangenberg beat the throw to first and Sanchez scored. "Obviously, you can't assume a double play for a reason," Kluber said. "It's not a given." Kluber became the only pitcher in Indians history to have five consecutive 10-plus strikeout games in one season. Bob Feller did it four straight times over the 1938 and 1939 seasons. Kluber has been dominant since spending a month on the disabled list with a strained lower back. He is 4-1 with a 1.24 ERA in seven starts since being activated. He has struck out 74 and allowed 27 hits in 51 innings. "We didn't help him tonight," Lindor said. "It's a very tough loss." Kluber was drafted by the Padres in 2007 and sent to the Indians as part of a three-team trade with St. Louis in 2010. He was pitching in Double-A at the time of the deal. "I don't think there's anybody left on that team that I even played with," he said. "I didn't think much of it." Indians RHP Danny Salazar (sore shoulder) will make a rehab start for Triple-A Columbus on Thursday. Padres: RHP Luis Perdomo (3-4) pitches Wednesday night in Cleveland. He has won two straight starts, striking out 10 batters over 11 1/3 innings while posting a 3.18 ERA. Indians: RHP Trevor Bauer (7-6) earned his seventh win last Wednesday against Texas, allowing one run in 6 1/3 innings.